Mormon Wookiee: #52: Salt Lake City Creek Center. 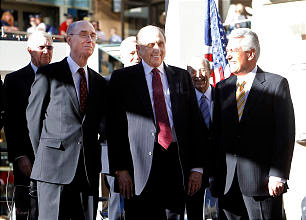 This week was the grand opening of the brand spankin' new "City Creek Center" shopping mall in downtown Salt Lake City. 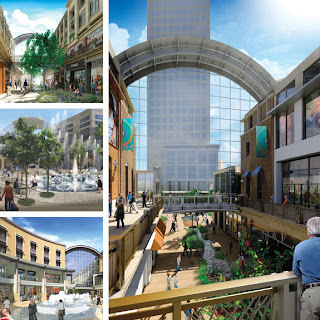 City Creek Center was a $2 billion dollar project built and funded by the Church's for-profit development entity City Creek Reserve, Inc (no tithing money was used to fund the project). Presidents Monson, Eyring, and Uchtdorf participated in the ribbon-cutting ceremony on Thursday morning. The mall is located directly south of Temple Square, and I imagine it will be packed next week during General Conference. Some of the great views of City Creek Center. Check out the size of that ribbon! Image from LDS Church News. Sunny day for a grand opening! 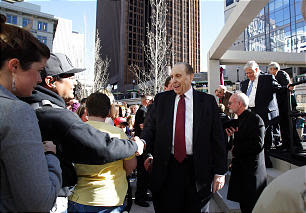 President Monson greets visitors at the grand opening. Although we didn't get to attend the mall's grand opening on Thursday morning, Diane and I did check out City Creek Center on Friday night, and I thought the mall was really fantastic. It has a giant retractable roof that is left open when the weather is nice, tasty restaurants (we went to Cheesecake Factory), some high-end stores like Tiffany's (reminds me of a song about breakfast), some mid-end stores like Foot Locker and the Disney Store (although, sadly, no Star Wars Store), live music, a water fountain show (similar to something you would see at the Bellagio in Las Vegas), and a beautiful man-made creek running down the center of the mall underneath the open walkway. This cute little girl had some fun in one of the fountains. Mmmmm, Cheesecake Factory. I was in the mood for breakfast, so I got an omelet with hash browns. Of course, I also ordered a delicious Peanut Butter Cup cheesecake for dessert. This lady was dressed up as a giant plant. It made me grateful for my day job. A couple of other great things about the mall is the fact that it is closed on Sundays and that there is no Victoria's Secret or any other kind of store with advertisements of scantily clad women. The mall had a great family-friendly feel to it, and I am grateful that the Church upholds its standards even in the for-profit realm. Next time you are in downtown Salt Lake City, make sure to come check out the new City Creek Center! The part about no stores with scantily clad women in their advertisements sounds great to me! Now I know where I am going to take my husband and son out now. We'll have to go check it out. It sounds like a great place to visit! And thanks for the info about the non-tithe funds. I was wondering about that. That mall is an amazing, and the proximity to temple square was nice. It is a cool place! If I used some tithe money to invest in a business, and the business had profits, and I used the profits to buy a mall, would you really say the funds didn't come from tithing? Where would you say they did come from then? I am not trying to be a troll, just curious as to how people justify that statement.. Sorry for the delay in getting back to you! You have a valid question. 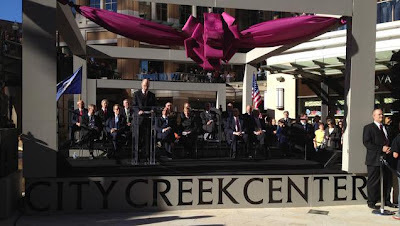 My understanding is that City Creek was not directly funded by any tithing donations; rather, the mall was fully funded by the Church's for-profit real estate entity Property Reserve Inc., which in turn was funded by other real estate ventures. Perhaps Property Reserve was originally funded by tithing donations, but I honestly do not know. If so, I imagine it would have been many years ago. That being said, I certainly understand people's hesitation with the Church's "business side" as it can appear to be in conflict with helping the poor, donating money, etc. For me, it comes down to a matter of faith and it helps to step back and ask myself, "Do I believe the Church is literally the restored Church of Jesus Christ and is led by a prophet?" If so (which I do believe), then I will do all I can to support and sustain the Church's efforts in whatever capacity I can. Hopefully that answer helps. Thanks again for your comment!